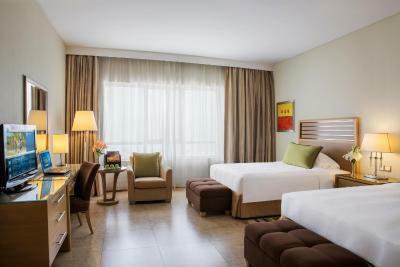 Lock in a great price for Nour Arjaan by Rotana - Fujairah – rated 8.4 by recent guests! Staff coutersy, especially Ramzin and Muddasars’ friendly assistance. I also like the room! Very spacious and comfortable bed! It was my only son's birthday and we really had a great time staying there. 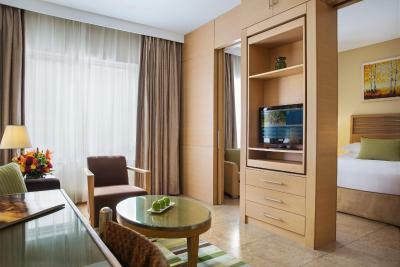 Very calm and well maintained suite. We enjoyed they stay. Very nice, location and cleanliness. Highly recommended. The rooms are fantastic, great for families and groups. Great location for us. Staff were friendly & accommodating. Right next to a supermarket & petrol station which makes self catering easy. I liked everything. And I would like to thank Ms Raven for checking in and assisting me. Excellent location and extremely comfortable facilities! Breakfast was very good! Location Nice hotel I would like to thank Mr. Jeffrey for helping us on luggage. He is polite. 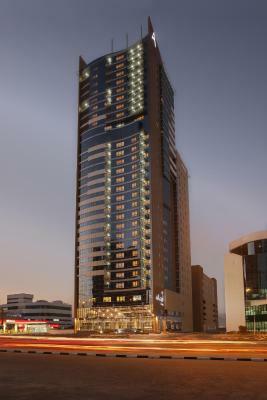 Nour Arjaan by Rotana - Fujairah This rating is a reflection of how the property compares to the industry standard when it comes to price, facilities and services available. It's based on a self-evaluation by the property. Use this rating to help choose your stay! 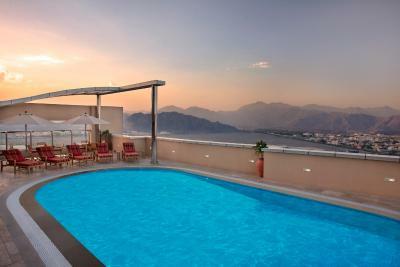 One of our top picks in Fujairah – and a guest favorite. 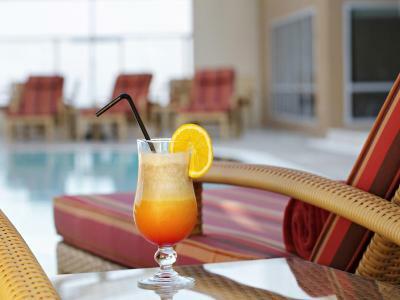 Featuring an outdoor pool with views of the Al Hajar Mountains, Nour Arjaan has self-catering accommodations with flat-screen TVs and a homey atmosphere. Its stylish restaurant serves rich international buffets. 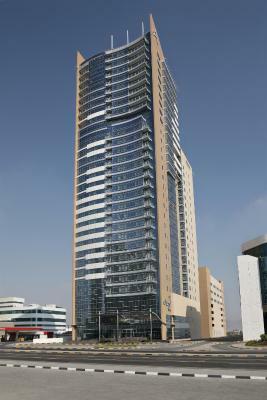 Nour Arjaan by Rotana is in Fujairah, 2.5 miles from the Gulf of Oman and about one mile from Fujairah Airport. Free parking is available on site. 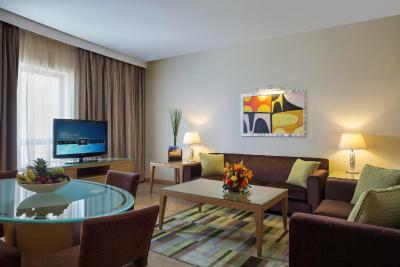 All Rotana’s spacious accommodations come equipped with satellite TV and high-speed internet. 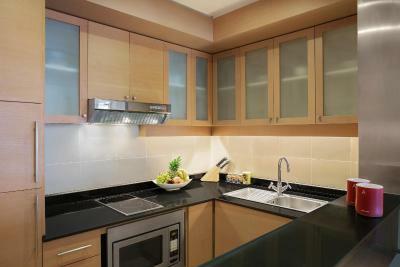 The kitchenettes include a microwave and a fridge, and the private bathrooms have a hairdryer. 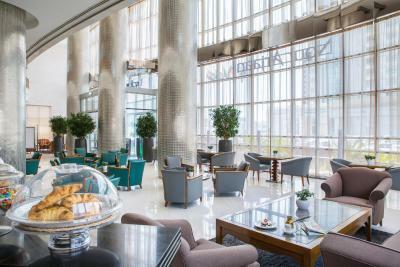 Nour Arjaan by Rotana – Fujairah has a restaurant with modern décor that serves international and regional cuisine. Aquarius Café has casual meals, refreshing cocktails and light snacks by the pool. 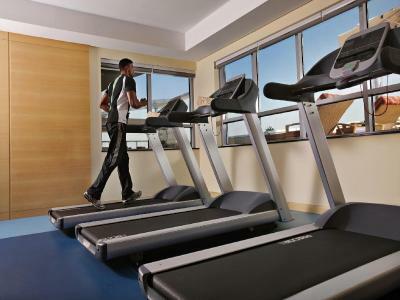 Bodylines fitness center features a fully equipped gym with group lessons, massage rooms and dry and wet saunas. Desert safaris, fishing and golf trips can be arranged through the concierge service. 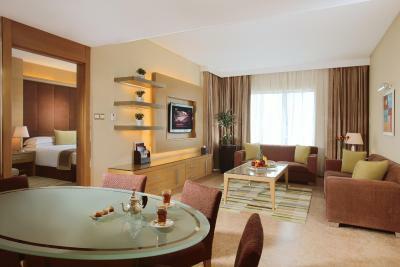 When would you like to stay at Nour Arjaan by Rotana - Fujairah? This spacious studio measures 52 square yards in size and features a comfortable sitting area with sofa, coffee table and writing desk. 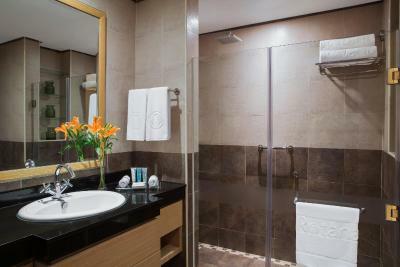 All have beautiful views overlooking the city and feature marble bathrooms with walk-in shower. 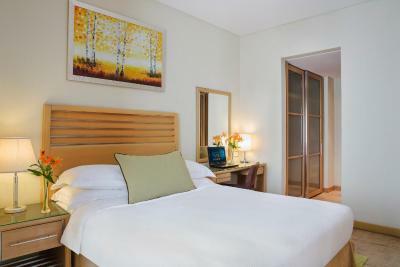 Classic Studio can be connected with the Premium One Bedroom Suite. 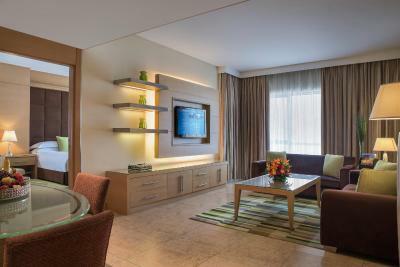 This spacious suite measures 52 square yards in size and comes with a king bedroom, separate sitting area with sofa, coffee table and writing desk. 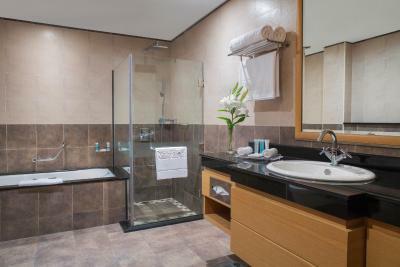 All have beautiful views overlooking the city and feature marble bathrooms with walk-in shower. Classic Suite cannot be connected with any room type. This spacious suite measures 88 square yards in size and comes with a king-size bed, separate living room with sofa, dining table, coffee table and writing desk. 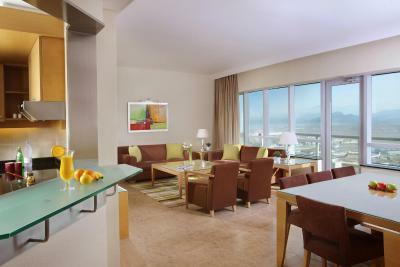 All have beautiful views overlooking the city and feature marble bathrooms with walk-in shower. Premium One Bedroom Suite can be connected to Classic Studio. This spacious suite measures 135 square yards in size and comes with king bedroom and twin bedroom, separate sitting room with sofa set, dining table and writing desk. 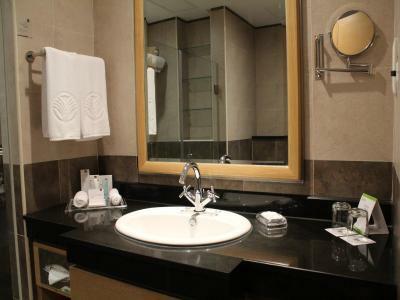 All suites have beautiful views overlooking the city and feature marble bathrooms with bidet, bath and shower. This suite comes with 2 king bedrooms and 1 queen bedroom, separate sitting room with sofas, dining table for 8 people and writing desk. All Suites have beautiful views overlooking the city and feature marble bathrooms with bidet, bath tub and a walk-in shower. House Rules Nour Arjaan by Rotana - Fujairah takes special requests – add in the next step! Nour Arjaan by Rotana - Fujairah accepts these cards and reserves the right to temporarily hold an amount prior to arrival. Please note that children below the age of 6 can enjoy breakfast for free. Children between ages 6 to 12 will be charged 50% of the breakfast charges. 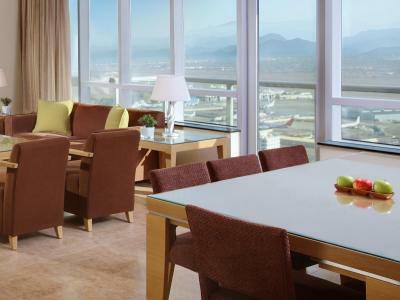 Please note that the hotel offers a transfer service from Dubai International Airport. Guests are kindly requested to inform the property in advance if they wish to make use of this service. Contact details can be found on the booking confirmation. 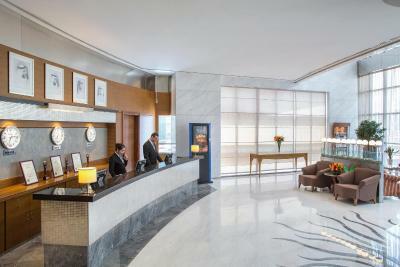 Please note that guests must present the credit card used to make the reservation upon check-in at the hotel. For information on third party billing, please contact the hotel prior to arrival for further details. Contact information can be found on the booking's confirmation. As per UAE law, you must present a valid UAE ID or valid passport upon check-in. Other IDs such as driving license or labor card will not be accepted. When booking 8 rooms and above different policies may apply and full payment in advance is required. Please inform Nour Arjaan by Rotana - Fujairah of your expected arrival time in advance. You can use the Special Requests box when booking, or contact the property directly using the contact details in your confirmation. There is some annoying smell in the corridors. May be it is due to the carpet. Need some fragrant environment in corridors. Love the wedding anniversary wishes sent by hotel manager and team with the delicious cake. Staff was amazing on the reception and in Marjaan restaurant. Facility is good overall but it'll be amazing if you'll think to connect the parking to accomodation floors. the hotel was fully booked when i arrived and most guests were late for checkout, thus may checkin was delayed for two Hrs. also when the room was ready no one called me to receive the room. the area around are under construction, so be aware of traffic jam and bad roads with bad GPS plan. 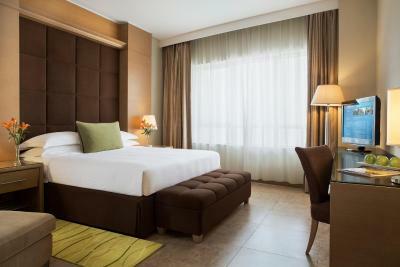 great staff and cleanness, near sheikh zayed mosque and good restaurants. Can't complain about anything, the staff and location were good. Size of the rooms and cleanliness were great. The food was good as well. The location is nearby restaurants and the beach. The room is spacious, very good value for the price we paid.